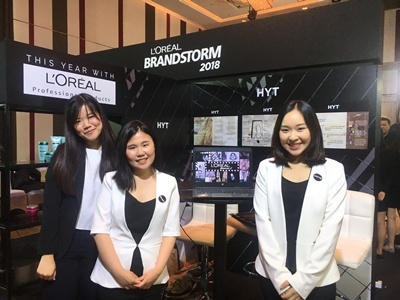 L'Oréal Brandstorm is one of Thailand's ultimate innovation competitions for all undergraduate students. This year is particularly different and also challenging since the mission is to create a new experience instead of a product. The mission is to invent brand-new professional salon experiences of the future integrating with all L�Oréal Professionnel hair products. All participants are required to pitch ideas of their breakthrough innovation for salon by leveraging digital solutions, connected technologies and new services. This year, with 90 participating teams, it consists of 3 rounds. For the first round, 15 selected teams must pitch ideas to the judges with 3 slides for 5 minutes. 8 teams were then selected and advanced to the National Final round. At the National Final round, teams made a 5-mins pitch to 3 panels of judges who are L�Oréal management team from various divisions at the Innovation Fair in the morning. Then, in the afternoon, the top 5 teams were selected to present to VIP judges, experts in digital and salon industry who provided insightful questions and comments. The winner will proceed to Paris to compete for international round as Thailand�s representative. We, team HYT, would like to say that we were very impressed and proud of our performance and improvement from beginning till the end of the competition. We have learned a lot from this competition as we got to integrate not only academic knowledge but also creativity to come up with ideas. Although we received a consolation prize and didn�t advance to international round, we were proud to be one of the 5 finalists. For us, it is such a great experience in our university life. Last but not least, we would like to thank to several people who helped us throughout the journey especially to Asst. Prof. Dr. Nopporn Ruangwanitand, who providing us feedbacks and advices, as well as friends for supporting us.